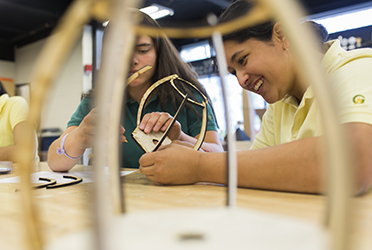 Diversity is not only a key tenet of the Greenwich Academy Mission Statement; it is one of the guiding principles our community is committed to creating and sustaining. For our students, the benefits of learning in a richly diverse community in which every individual is respected and affirmed are immeasurable. At Greenwich Academy, our diversity efforts blend seamlessly and are experienced through the School from curriculum, to global programs, to hiring. Our community is reflective of the world we live in with broad representation of different cultural, ethnic, and socio-economic backgrounds. In this environment students learn to become effective, active, informed citizens of the 21st century. Today, students of color represent 29% of the student body. People of color make up 18% of the faculty and 14% of our staff. 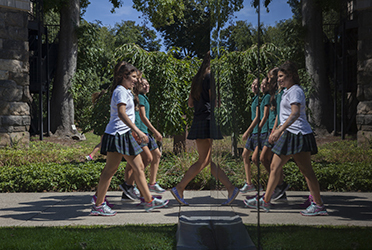 In keeping with the school’s motto “Toward the Building of Character," Greenwich Academy affirms and respects the individuality of all members of the community. The school’s ultimate goal is for students to develop the confidence and compassion to interact freely and authentically with people who represent a rich variety of backgrounds and beliefs in terms of race, ethnicity, culture, religion, socioeconomic status, sexual orientation and family composition. All members of the Greenwich Academy community---students and alumnae, faculty and staff, parents and trustees- are expected to honor and value the school’s Diversity Mission Statement.